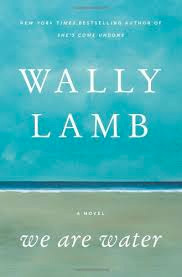 Wally Lamb’s We Are Water is the fourth of his novels that I’ve read, and while I’d put it third behind The Hour I First Believed and I Know this Much is True, let me be clear – an average Wally Lamb is still better than about 75 percent of what I read. We Are Water is the story of Annie Oh – but also her husband, Orion. Annie is an artist who has decided to leave Orion after 27 years of marriage because she’s in love with her female publicist, and they plan to be married. Told in alternating voices – Annie, Orion, Andrew (their son) – with additional single interlude from sub-plot characters – We Are Water is ultimately about the secrets we carry and damage these underlying currents wreck on our relationships as well as the grace and forgiveness necessary to heal. Annie has many secrets. A flood that took her mother and infant sister initiated a series of tragic events that she hides with guilt and shame, and they haunt her until her (second) wedding day. When they are finally revealed, a lifetime of family dysfunction is explained, but it may be too late to repair the damage. This wasn’t a book club selection, but I did discuss portions of this with a couple of fellow book club members, and based on that, I think this would make for a good discussion. Regardless, for readers, it is definitely worth picking up.